Believe it or not, gratitude is one of the most powerful forces in the universe. It is a powerful weapon in spiritual warfare. It can transform broken relationships, rescue marriages, improve your mood, boost your health, and so much more. You must not underestimate the power of thankfulness. It is awesome. That's why I'm glad that our forefathers had the foresight to make it a national holiday. They recognized how they were blessed and created an annual event to remind us of that fact. What they may or may not have been consciously aware of is that WE WERE MADE FOR THANKSGIVING (the attitude, not the holiday). Think about it, the core of worship is an attitude of thanksgiving. This is exactly what our lives as humans and more so, as believers, is supposed to be all about. The wise writers of the Westminster Catechism say that we were made to worship - "the chief end of man is to glorify God and enjoy him forever." I agree! Do you? Are you increasingly thankful to God for who He is and what He has done in your life? That is the greatest gift we have. Take time and meditate on the truth of the Gospel. Let it seep into your bones. I guarantee that you will begin to be more and more grateful, and thus more joyful, every day if you do that. What about for all the people He has brought into your life? You wouldn't be where you are without them. God put them there to bless and challenge you so that you might grow to be more Christlike. It may be difficult, but thanking God even for the difficult people may be just what you soul needs today. Consider also your circumstances. I know, they're sometimes less than ideal (understatement of the year, right?). It's not easy to take James 1: 2-4 to heart when you're in the eye of the storm, but I challenge you to grab hold of the truth in that passage, no matter how bad it may be right now. When we look back on our lives, it's so much easier to see how God has carried us through so much. How much more will He carry us through? What is yet to come? Friends, we have a lot to be thankful for at Woodland Shores this year and plenty of opportunities to celebrate God's goodness together. I just want to highlight a few. OPERATION CHRISTMAS CHILD! We would love to have tons of people join us for that. It's not too late to pack a box to bring, either! COMMUNITY THANKSGIVING EVE SERVICE All five of the local North American Baptist Churches are gathering at Woodland Shores for a special Thanksgiving Eve service. 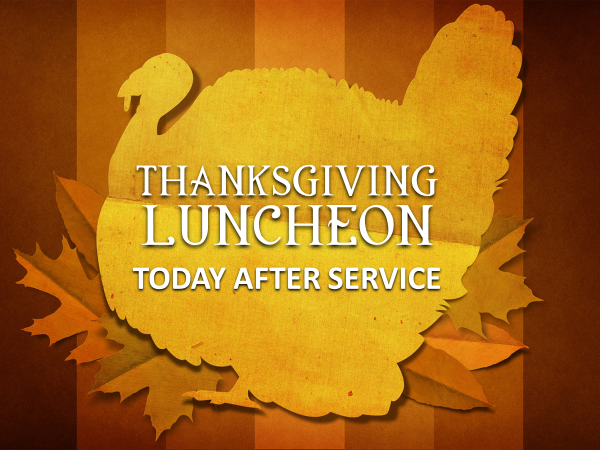 Pastor Duane Anderson will be preaching and our worship team will be leading us into God's presence with thanksgiving. We will also be taking an offering for Forgotten Man Ministries, a great ministry to those in jail or prison, and their families. Of course I can't forget to mention our Pictorial Directory and the Holiday Arts & Craft Fair happening this weekend. You don't want to miss these great events. Click through the links to more information on all of these events. Last but not least... If you've been procrastinating on enrolling in the Perspectives on World Missions class that we are hosting starting in January, don't forget that if you apply before the end of the month you get an additional $50 off this college-credited course. Perspectives promises to broaden your worldview and give you a better sense of how God has moved in the world in the past, how He is moving now in world missions, and how He can use you in the future wherever He calls you to be. There's so much to engage in this holiday season that it can't all be contained here. So much to be thankful for! Keep checking the website and reading your bulletin for more information. I'm so thankful for all of you! YOU ARE LOVED!